Replacement windows are a significant investment. An investment in time, money and the standard of your home. With the right windows, your home becomes a place of comfort and warmth that you're proud of. Poorly chosen windows can spoil the look of your home and let in draughts, cold and noise. Around 20% of the heat escaping from any home is lost through its windows, so it pays in the long term to understand how to make the right window choice. Modern high-quality windows are efficient and durable, so you're unlikely to upgrade often. That's why, when you do decide to replace your windows, it's worth installing windows with a high energy rating straight away. Window Energy Ratings (WER) are a guide to the energy performance of your windows. The British Fenestration Ratings Council (BFRC) window energy rating scheme checks all the components to ensure the final window achieves the energy efficient standard claimed. This means that you just need to look for the A-G ratings and remember A is best - the higher the energy rating, the more energy efficient it is. Simple when explained, isn't it? 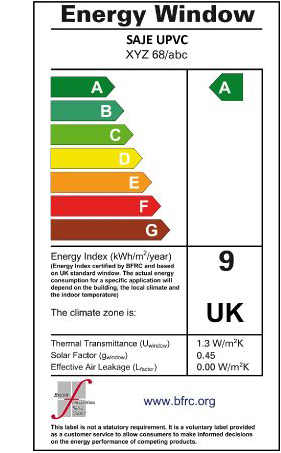 The latest Building Regulations require all new homes to have a minimum 'C' WER rating. This is a useful benchmark to consider when choosing replacement windows. Windows from SAJE have an energy rating of beyond A+ - the highest ratings possible. This is because our windows feature an advanced six-chamber outer frame and PVC-U Thermal Inserts for 'A'-rated thermal efficiency. In other words, our frames are used to create the most energy-efficient PVC-U double-glazed windows available in the UK. You can also be sure that our manufacturing methods are sustainable. We use 100% recycled material in our PVC-U Thermal Inserts. Plus all our components are manufactured to the ISO14001 environmental performance standard. Reduced energy bills: energy efficient glazing could save you around £130 per year on your energy bills. Peace and quiet: as well as keeping the heat in, energy efficient windows insulate your home better against unwanted outside noise. Energy efficient windows, when installed properly, can pay for themselves in lower heating and cooling costs over a period of years. Taken together with improved comfort and appearance, high performance windows from SAJE are one investment every home can benefit from.